Throughout the 19 century, more than 30 Native American tribes and nations settled in Oklahoma after being expelled from the ancestral homelands all around the United States. The Dawes Act in 1887 divided the lands of individual tribes into allotments for individual families and encouraged farming and private land ownership among Native Americans but also expropriated land to the federal government. Railroad companies took nearly half of land held by Native Americans within the territory for outside settlers and for purchase. 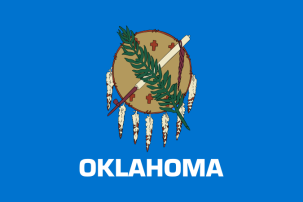 The Department of Health has some Oklahoma birth records and Oklahoma death records dating from after October 1908, but they are not complete until 1940. Oklahoma vital records are available by application for a fee and with proper identification. Acceptable payment is personal check or money order. Record Access Requirements: Must have a signed release from person of record or entitled family member. Email questions to askvr@health.ok.gov. Record Access Requirements: Records are open to the public. Email questions to askvr@health.ok.gov. Note: Also, daytime phone number. Note: For genealogy records, contact the OK Historical Society, Wiley Post Historical Building, Oklahoma City OK 73105-4997, phone: 405-521-2491, FAX: 405-525-3272.